Your student is a week away from the start of the Fall semester. I’m sure it’s been a roller-coaster of emotions…for everyone! We are excited to welcome everyone to campus and support our students in achieving their academic, extracurricular and career goals. If you're sending your student off to college for the first time, August can be overwhelming as you try to keep track of everything. We understand and would like to offer reassurance. It’s perfectly normal if your student is suddenly nervous or experiencing “cold feet” about attending college. Ask your student to think about what initially excited them about attending GW. They should trust their decision and give it a try. Be patient with your student who doesn’t seem very organized or haven’t started packing yet. You may feel that lists are important and getting an early start will make the process easier. Keep in mind that there are some students who pack their suitcases, boxes, and trash bags the night before leaving for school. The final weeks at home are all about connecting with friends and saying farewells (even though they'll be texting each other often). In some ways, your student is beginning the inevitable and necessary process of separation. Go with the flow on Move-in Day. This will be the height of emotions for everyone, but being prepared will help. Let your student take the lead. It's a high-stress day. And when it comes time to leave- know that there may be lots of intense emotion- and be sure to congratulate yourself on the ride home. If you need a place to unwind and re-charge after move-in, be sure to stop by the Family Welcome Center to mix and mingle with other families, chat with staff/administrators and learn about the support resources available for your student while enjoying light refreshments. Mount Vernon Campus families can stop by from 9:00am-12:00pm on the Mount Vernon Campus Quad and the Foggy Bottom Campus families can visit the Marvin Center Great Hall from 10:30am-4:30pm. As you are an integral part of this transition, we would like to provide you with the opportunity to get involved in the GW community through the GW Family Ambassador Program. The next four years will bring a wealth of new experiences to your student and will offer many ways for you to contribute to our campus community. Click here to view the focus areas for the 2018-2019 academic year. We look forward to partnering with you to enhance your family's experience at GW! Please do not hesitate to contact our office at 202-994-6710 or via email at [email protected] if you have any questions or concerns. All residential students should have received an email message from GW Housing that confirmed their arrival date. If your student is unsure of when they are scheduled to arrive, please encourage them to email [email protected]. Prior to arriving to campus, students need to complete the self check-in via GW Housing e-Services and confirm the arrival information for their residence hall so they know where to check-in and get their key. Finally, we have compiled a list of move-in tips to try and make your move-in experience as smooth as possible. Due to ongoing SafeTrack operations, there will be limited Metro service on the Orange/Silver/Blue Lines from August 11, 2018 to August 26, 2018. Orange and Silver Line trains will single track between McPherson Square and Smithsonian, with trains running only every 20 minutes at all times of the day. During rush hours, additional Yellow Line trains will operate every 16 minutes between Franconia-Springfield and Greenbelt, in addition to Blue Line trains running every 16 minutes between Franconia-Springfield and Arlington Cemetery. On the weekends of August 11–12 and 25–26, Farragut West, McPherson Square, and Metro Center (Orange/Silver/Blue :ines) will be closed. If you are planning to utilize the Metro when you travel to campus, please keep this scheduled work in mind. 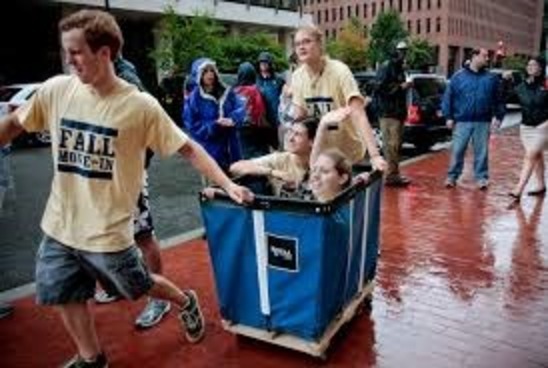 Welcome Week at GW provides opportunities for students to connect, build relationships, learn about resources, and build a community at GW. Welcome Week events showcase the many resources GW has to offer for academic success and features opportunities for involvement at the Mount Vernon Campus, in the performing arts, sustainability activities, multicultural student services, international student activities, student organizations and much more! Click here to view the schedule of events. ALL undergraduate students, medical, on-campus nursing, on-campus Health Science, and ALL international students holding a J1 or F1 visa are required to carry student health insurance while they study at GW. These students will be automatically enrolled in the GW SHIP and must submit an opt-out waiver if they have another insurance plan that meets the required criteria listed below. For more information, please review the 2018-2019 MANDATORY Plan Highlight Sheet. Click here for additional information. Join the GW community on Friday, October 26th – Sunday, October 28th for a celebration of alumni, families, students, and friends! The weekend will include a kick-off party with live music, faculty lectures, Colonials Madness, Dean’s Receptions, family information sessions, the Taste of GW food festival, the Vern Harvest, Acapellapalooza, the Jazz Brunch, and much more! Click here to register and view the tentative schedule of events. We understand that there can be a lot of things to keep track of when it comes to your student attending GW. The Colonial Student Services New Undergraduate Checklist should assist you and your student in establishing and maintaining good financial and administrative standing with GW. Students can add up to 5 authorized users in their Student Account eBill system. Authorized users have access to the eBill system only, and do not have access to view grades, course information, or financial aid award letters. If someone other than the student (e.g., a parent, relative, spouse, etc.) will be making payments to the university, the student should add them as an authorized user on the account. The student is the only one with the ability to grant access to the eBill system. GW does not issue paper statements. Students and authorized users are notified by email when a new statement is available. Please keep in mind that payment for each term is due on the first day of the semester. Many families want to know their student's grades, ask about their academic performance or check on their finances. Access to all of this information falls under the federal Family Educational Rights and Privacy Act (FERPA), which places limits on the right to review their educational and financial records. Once your student is enrolled, regardless of age, you will not have access to his or her records unless your student gives their consent. Students can give family members consent by completing the Student Consent Form. If a student does not give his/her consent to access his/her educational record, family members can complete the Certificate of Financial Dependency to gain access to this information. An explanation of this process and necessary documentation can be found on the Financial Dependency Form. All course materials- including all textbooks- are only available online at the GW Campus Store. Students can purchase new, used, rental and digital textbooks with free in-store delivery for no shipping costs and convenient pick up from the campus store location on Marvin Center's lower level. To ensure timely and accurate delivery, please send any mail or packages to your student’s complete campus address and the 20052 ZIP Code for the Foggy Bottom campus and the 20007 ZIP Code for the Mount Vernon campus. Properly addressed incoming mail is delivered within 24 hours of receipt from the United States Postal Service (USPS). Any incoming mail that does not contain a complete and/or correct address must be researched to determine the correct address delivery information. Research processing can add 10-21 days to the delivery time. Click here to view the mailing addresses. The university recommends that students insure their personal property. Such personal property may be covered under your homeowners' insurance but should be checked and verified in writing by the Homeowner's insurance representative. Alternatively, renters insurance can be through GradGuard and features comprehensive coverage for all your college essentials. Free quotes are available online. GW Alert is the university notification system that sends emergency alerts to e-mail addresses, mobile devices (text messages), institutional IP desk and residence hall phones, social media and university webpages. Students, faculty, and staff are automatically enrolled. Family members cannot sign up for GW Alert text message or email alerts independently. However, up to three mobile devices and two email addresses can be added to a student’s user profile. Click here for additional information. Encourage your student to download the GW Personal Alarm Locater (GW PAL). GW PAL is a mobile safety and security application that can be downloaded on an IOS or Android smartphone. The GW PAL app allows users to alert the GW Police Department of a crime, report crime tips anonymously, provide a safety profile, and identify their location in real time. Click here for additional information. Campus Advisories is the university’s primary website used for communicating emergency preparedness and incident-related information to the GW community. Users can visit the website for updates and changes in university status, adverse weather conditions, important issues concerning safety, and anything else that may disrupt normal operations. Click here for additional information. Click here to view the Fall Semester 2018 and Spring Semester 2019 calendar which includes key academic dates for the semester, such as holidays, exam periods and modifications to class schedules.